I’m pleased that I have been able to work with a community of like-minded family law attorneys to offer an alternative. While not appropriate in all divorce cases, this alternative does offer clients an opportunity to build a new, if different, family. A friend of mine, a wedding photographer, tells me one of the biggest challenges of his work comes with attempting to juggle the divorced parents of the bride or groom. Miss Manners columns advise on how to handle the invitations and where to seat the parents and their significant others. 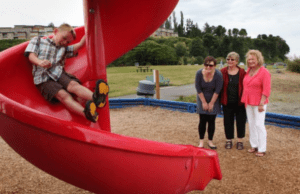 Similar horror stories abound for other significant family events such as bar/bat mitzvahs, college graduations and even piano recitals and soccer games. These events are for the honoree and the marital status of the parents should not cause tension. Often this bitterness is the result of an acrimonious divorce. While divorce will continue to happen, many family law attorneys now work with their clients to create a new way to divorce without the lingering hostility. A family therapist who works with divorcing couples explains the progression of the couple’s relationship. When they first married, they became husband and wife, and when they had children, they became mom and dad. Now that they are divorcing, they will no longer be husband and wife, but they will always be mom and dad. Recognizing the importance of this relationship, couples are searching for ways to terminate the marriage and yet preserve the future relationship as parents. There are several models for non-adversarial divorce. Washington has a growing contingent of professionals practicing collaborative divorce, mediation, negotiation and other non-adversarial ways of handling marriage dissolution. There are several professional collaborations that include family law attorneys, mental health professionals, financial specialists and mortgage professionals. There are many smaller practice groups meeting regularly to hone their skills and learn from each other. It is interesting when the marriage counselors meet with the divorce lawyers and learn to communicate with each other. Collaborative law has specific protocols where the professionals form a team with the divorcing couples. Mental health professionals may act as coaches for the parties, helping them learn to communicate in a more productive manner, or a child specialist may help the couple develop a parenting schedule that makes sense for the children and the family’s needs. There are other models for non-adversarial divorce. Several attorneys have left the courtroom to work with couples as mediators to help clients forge their own marital settlement agreements and parenting plans. Some attorneys pledge to work cooperatively with each other in a non-adversarial manner. There is growing demand for unbundled services from attorneys who can assist couples with a “kitchen table” divorce, with the parties working out their own issues and the attorneys acting as facilitators for the legal process. I have been writing about non-adversarial divorce in a small local paper for a number of years. The paper has an online version and I have received calls from attorneys in several states and even the United Kingdom requesting permission to reprint the articles in their local publications. These attorneys are primarily seeking better ways of serving their clients, but are also looking at how this model affects their own lives. They are looking at reducing the stress caused by highly litigious cases. While forming a new family relationship in the midst of a divorce is a desirable goal, it isn’t always possible. There will still be a need for traditional litigation and I applaud the difficult work undertaken by my litigator colleagues. For family law attorneys who are feeling burned out, I do suggest they investigate the possibilities offered by these emerging dissolution models. I have a picture in my office as an example of a new family created after divorce. It is a picture of my own daughter’s wedding with her husband’s parents, her father and both of her moms. 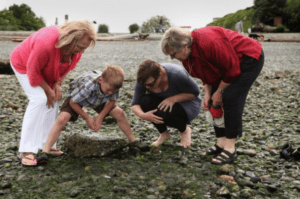 My grandson finds it perfectly normal and quite desirable to have three grandmothers. 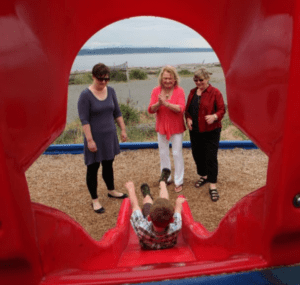 Karin Quirk of Kirkland (center) and Janet Lewis of Edmonds (right) enjoy their grandson, John Vavrick, as he cruises down the slide at Marine Beach Park in Redmond, while John’s mother, Kathleen Quirk of Lynnwood (left), watches. Karin’s ex-husband married Janet after his divorce. The two women stayed friendly even after he died. It can be done and the children, parents, and grandparents are the better for it.